In 2015, the Tajik Ministry of Health and Social Protection, with technical support from WHO, adopted its current service delivery mechanism and initiated community-based rehabilitation (CBR) programmes in 10 districts in Tajikistan. CBR programmes are conducted in collaboration with local nongovernmental organizations and the Tajikistan CBR network. CBR is a major focus of the disability rehabilitation programme in Tajikistan and is supported by the United States Agency for International Development (USAID). In December 2014, the Ministry and WHO organized the first national conference on CBR entitled "Reaching the unreached" in Tajikistan. With 400 participants, the conference was one of the largest events on disability issues in Tajikistan. The conference reinforced the message that through the combined efforts of people with disabilities, their families and communities, and relevant government and nongovernment health, education, labour, social and other services, an equitable environment can be generated. The conference provided guiding principles to implement CBR programmes and laid foundations for initiation of Government-managed CBR programmes in Tajikistan. To further strengthen the Ministry's capacity to implement and monitor government-funded and managed CBR programmes, a high-level delegation from Tajikistan travelled to India in February 2015. The delegation consisted of key policy-makers from the Ministry: the Adviser to the Minister; the Head of the Department of Mother and Child Health and Family Planning; the Head of the Department of Social Protection; and the Head of the State Agency on Social Protection. 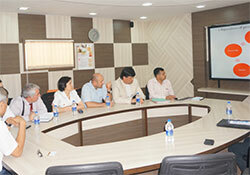 The objective of the visit was to orient the delegation on disability-related policies and services focusing on CBR. The delegation visited various governmental and nongovernmental organizations/institutions addressing disability issues, as well as training institutes in the field of rehabilitation. The delegation also visited Government-managed CBR programmes in rural areas of India and met with Government officials on CBR. The visit provided valuable insights on the needs and benefits of multisectoral collaboration and the importance of partnering with civil-society organizations, especially disabled people's organizations. The key lesson from the visit was how CBR can reach the most vulnerable section of society and contribute to the formation of a disability-inclusive society. Community-based rehabilitation was initiated following the Declaration of Alma-Ata in 1978. Over the years, it has evolved into a multisectoral strategy to address the broader needs of people with disabilities. CBR is an effective strategy to meet the objectives of Health 2020 in an equitable way and reach the most vulnerable population of a country. The World Health Assembly resolution (WHA58.23) and the "World report on disability" (2011) recommend CBR as a strategy for rehabilitation, equalization of opportunities, poverty reduction and social inclusion of people with disabilities.